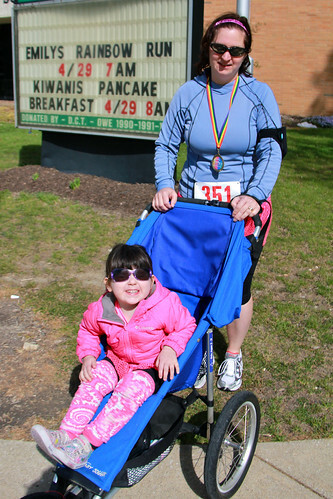 On Sunday, Liz and Claire participated in Emily's Rainbow Run. Claire did a hundred-yard dash for kids six and under, for which she was delighted to receive a colorful participation ribbon (she was more interested in waving to the crowd than in running), and Liz won her division in the four-mile run! It was a fun morning and a beautiful day for a race, and I'm proud of both of them.